A local nursery close to our house had great prices on the plants, so we bought from there and spent a little over $20 on those. We planted six squash, two bell pepper and ten tomato plants. The tomato plants are a mix of regular and heirloom varieties. Two are Early Girl Tomatoes plants that produce at the beginning of the season. So my fingers are crossed that they all produce and we get a bumper crop of veggies! We still have a lot of work to do. The tomatoes need to be staked, and we are going to hook up a drip system to water automatically. It gets really hot here, so I can’t be trusted to water every day by hand. If I forget, our plants will bake for sure. Also on my garden agenda is an herb garden, a pretty flowering plant for the little half moon bed outside our dining area window, ground cover around the beds, a screen for our AC unit and a permanent fence to keep our dogs out of the area. We have two labs, and they are crazy for freshly planted plants. So that’s our veggie garden for now. Not too pretty yet, but very practical! The kid’s are excited about the progress. They like helping with the watering. We don’t have any weeds yet, but when we do, I’ll get them busy pulling! 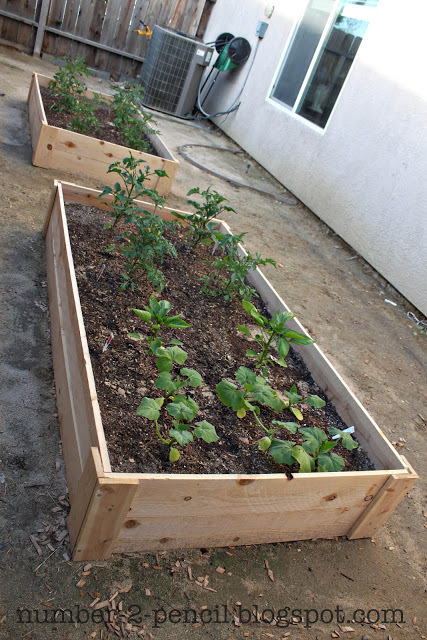 I’m already thinking about next year, and and very curious about the square foot gardening technique. Six squash . . . we will be down mid-summer to pick up our share of the surplus! 😉 We bought a tomato & a jalapeno plant yesterday. The rest we are trying to grow from seed, at Norah’s request. Probably planting tomorrow. 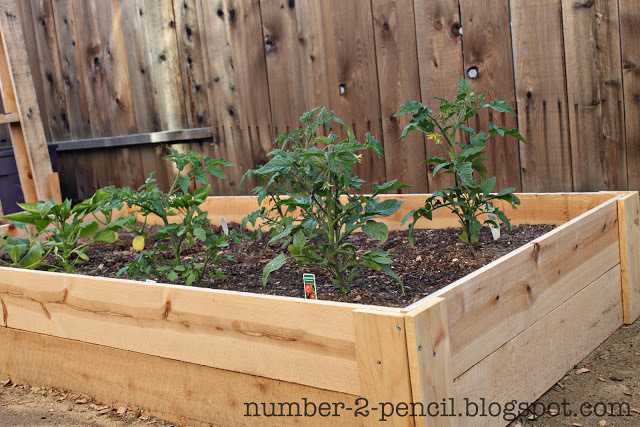 We’re planting vegetables in containers in the back yard for the first time–I hope our dogs leave them alone! This is the first year we have an area when can keep the dogs out of. We have tried to plant things before, but the dogs always ate them before we could. Looking forward to picking tomatoes with the kids, and hoping they will try them! 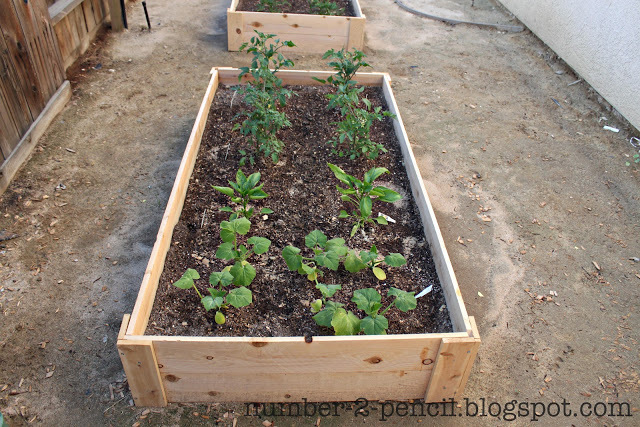 Love the raised beds! 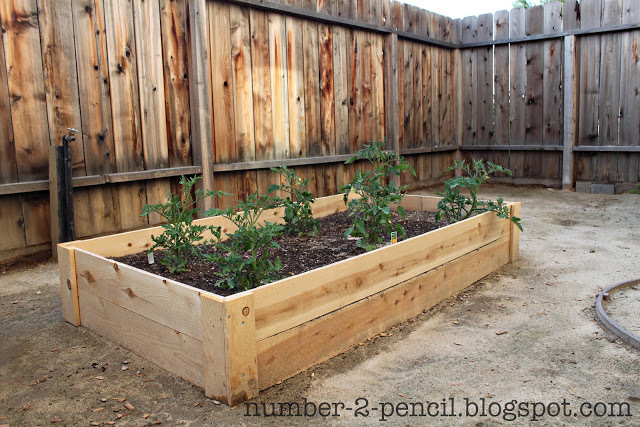 This is a project we are going to try and complete ourselves this summer! Aren’t raised beds the BEST? I love gardening and your garden looks great. P.S This is my first time visiting your blog and I think it’s super cute!